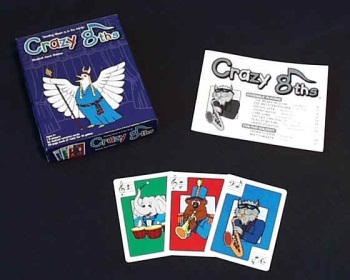 Crazy eighths cards are ideal for musicians of any age! They creatively combine music education and popular card games played by reading notes rather than numbers. These games range in difficulty. Beginners can easily master "Go Fish" and "Old Maid" while more advanced players love the fast and furious fun of PIG and CRAZY EIGHTS. Anyone can join in by using the cheat sheet card. This approach to reading music has proven to be successful! Teacher's kit includes 5 decks of cards.